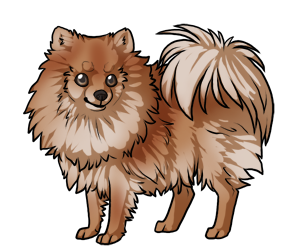 Originally bred as herding dogs, the Pomeranian's ancestors were much larger and weighed somewhere around 30 pounds. The breed got its name from Pomerania, now modern day Germany and Poland. The breed began to be downsized when Queen Victoria took an interest in the smaller pomeranians. Almost immediately, breeders began to selectively breed for smaller and smaller sizes. The AKC recognized the breed in 1900. Today Pomeranians primarily serve as loyal companions. Pomeranians were two of the three dogs to survive the sinking of the titanic in 1912, escaping on lifeboats with their owners. The Pomeranian has been ranked in the top 15 most popular dog breeds in the United States for the past 10 years. In countries outside the United States the Pomeranian is known as the "Zwergspitz" or dwarf spitz.